In addition to taking picture, GeoCam Pro is the only tool on the market that offers you to record video with a geographical data overlay. 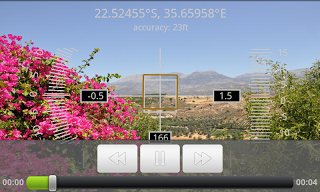 You can use it to take measurements on site and add your audio comments, or to record your moves for example when you are on a glide, you can review how it went. Enter a name for your video and click OK to save it to a file. The list of recorded videos is available the Geocam gallery. They will "lazy load" after the pictures (ie they will appear as they are loaded). Click on one video to play it. It will then be played like any other video, but the geographical data overlay will appear. The cursor style, GPS format will be taken from your current settings, not from the time when you saved the video. You can therefore customize the way you want to review it. Use your desktop computer to export customized video files. See the Studio page to find out more.